To the east of the north Pontic area, the evolution of the early Khvalynsk–Novodanilovka cultural-historical area gave eventually way to different interconnected local cultures after ca. 4000 BC, whose main demographic base were the previous expanded patrilineally related clans, developing in close contact with each other, but also in contact with neighbouring emerging cultures. Their language is to be associated with an evolving Late Proto-Indo-European (Anthony 2007). The Caspian steppes linked to the Lower Volga, the Lower Don, and the northern Caucasus region were characterised by the evolution of kurgan burials; the spread of catapult-shaped bone pins (later modernised as hammer-headed pins ca. 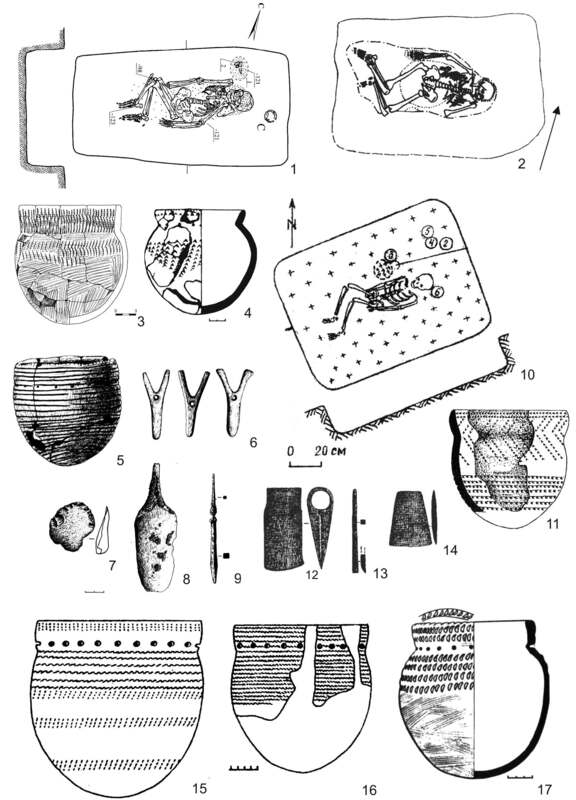 3000 BC in the early Yamna culture on the north Pontic area), developed in parallel in Repin and northern Caucasus areas; pottery assemblages similar to those expanded previously under the Khvalynsk–Novodanilovka period (i.e. similar to the one continued by Kvityana, but distinct e.g. from the innovative Deriïvka); etc. (Anthony 2007). On the Lower Don, the Konstantinovka culture appeared as a continuation of the previous kurgan cultures with rich assemblages, distinct from the flat cemeteries of the Dnieper region. Characteristic of this culture is its orientation towards the Maikop culture, whose influence remains initially restricted to the Lower Don region (Rassamakin 1999). The change of early to late Khvalynsk on the Lower Volga is defined by the Kara-Khuduk site in the Caspian region, and Razdorskoe on the Lower Don, and thus dated to ca. 3900–3800 BC, but it must have lasted at least until the expansion of the Repin culture. Pottery from this site includes incised ornament and rim form which mark its difference with the early Khvalynsk culture (although a similar rim fragment comes from the Khvalynsk cemetery), and connects this region to the Middle Eneolithic Pontic–Caspian steppes. The third stage of the Samara culture (marked by the Totsky-type grave goods, from Ivanovka), attested until the mid–4th millennium BC, can be included in the late Khvalynsk culture (Rassamakin 1999). The early Repin culture (beginning ca. 3900/3800 BC) appeared in the region west of Khvalynsk, north of the Konstantinovka culture, and east of the Deriïvka and Kvityana cultures. It emerged on the territory of the previous Neolithic Lower Don culture, and continued the local tradition of pitted linear decoration, and clay bosses applied at the base of the neck. Settlements of the Repin type were few and short-lived, whereas the ritual of burying under kurgans became more widespread. Settlements and burials point to a subsistence economy based on stockbreeding and nomadic or semi-nomadic way of life. The economic changes in Repin brought about a transformation in the social and spiritual sphere, too (Rassamakin 1999). Its pottery is original, combining characteristic features of Eneolithic pottery, showing thus continuity in methods, technology, and morphology with neighbouring Volga–Ural (Khvalynsk – Samara) and Near Don (now inherited by Kvityana) areas. Typologically, it comprises high vessels with profiled necks and spherical or flat bootms. Technologically, it included silt or clay containing silt, with an admixture of ground and shells and some organic solutions; vessels were made with the help of moulds, and their surface was smoothed and then decorated with comb stamps in different motifs (Rassamakin 1999). At the end of the 5th and during the 4th millennium, the steppe region was characterised by dry climatic conditions worsening gradually, with short-term but violent floods in the Volga–Ural region, and the peak of aridity happening during the late Repin / early Yamna period in the mid–4th millennium BC (Khokhlova et al. 2018). Forest in the river alleys receded markedly, and semi-arid landscapes appeared in the areas with the lowest rainfall to the south of the Pontic lowlands (see below Figure 23). Steppe grass-cover changed and pastoral productivity fell by ca. 50–60% in the whole region, which must have affected all cultures of the area, benefitting more specialised and mobile types of animal husbandry (Parzinger 2013). In the fourth millennium, sheep–goat still dominated the domesticated animals of the north Pontic area (e.g. Mikhailovka I, Sredni Stog II, or Usatovo, all showing up to 60% of sheep–goat remains), and it probably also composed the majority of the diet (together with cattle) in the Don–Volga–Ural region. Until 3500 BC, steppe populations were still largely hunters, gatherers and fishers who had herding as an adjunct to their foraging-centred economy (Anthony 2016). 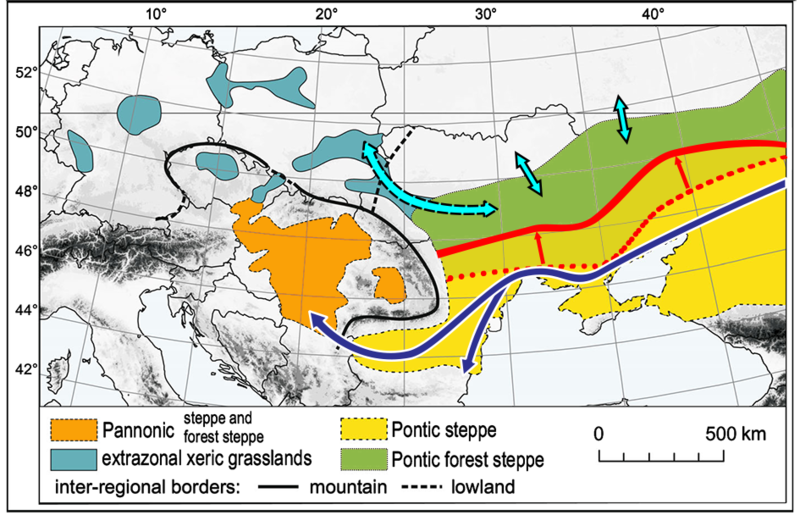 Unlike settlements to the west in the north Pontic area, cultivated cereals do not appear during the Eneolithic in the Don–Volga–Ural steppes, though. The Repin culture, characterised by its cattle-breeding subsistence economy and semi-nomadic way of life, with much less reliance on hunting and fishing, must have emerged and spread benefitting from the expanding grasslands and retreating settlements of neighbouring cultures. Extensive use of broad, unsettled (or abandoned) steppe areas with little access to water was facilitated by highly mobile groups, no doubt thanks to horse-aided herding and wagons, without which the rapid adaptation and improved economic performance of this regional group would be unimaginable (Anthony 2016). Wagons revolutionised the pastoral economy by providing bulk transport for tents, water, and supplies in combination with horseback riding, for which there is clear contemporary evidence in the Botai culture. Riding increased the number of animals a single herder could watch and control, and also improved a wagon-based mobile way of life (Anthony 2016). It is disputed whether wagons were also pulled by horses apart from bovines, though, because there is no direct evidence of the use of draft horses. The widespread remains of burials and the rare finding of settlements, represented by seasonal camps of herders, starts in this period and continues into the late Repin / early Yamna stages. All modern domestic horses investigated to date only show ca. 2.7% of Botai-related ancestry, with Przewalski’s horses being feral descendants of Botai domesticates. This supports the existence of a different centre of domestication becoming the source of all modern domesticated horses, which incorporated minute amounts of Botai ancestry during their expansion. Ancient specimens from Russia, Romania and Georgia show this ancestry, suggesting its expansion to the east and south before ca. 2000 BC (Gaunitz et al. 2018). The most likely candidates for the expansion of the domesticated horse into Europe and Central Asia are therefore Yamna settlers from the Pontic–Caspian steppe. Figure 21. Materials of the Repin type: 1, 2, 10 burials under kurgans; 3–5, 11, 15–17 pottery; 6 bone; 7 stone; 8–9, 12–14 copper. From Morgunova (2015). The genetic turnover identified in horses (Gaunitz et al. 2018) might be associated with the suitability of horses in Repin for long distance travel and warfare, rather than localised pastoral and hunting activity of Botai horses, possibly derived from earlier Khvalynsk domesticates. The likely long-term specialisation based on selective breeding in late Khvalynsk/early Repin is compatible with the existence of horse domestication in the Don–Volga–Ural area since the Khvalynsk–Novodanilovka period. The adaptation of Yamna horses to other environments, as well as the gene flow over long distances, is suggested by weak geographic patterns among long-range similarities between Europe and East Asia (Zhang, Ni, et al. 2018), and by the rapid expansion and development of certain breeds since the estimated time of domestication (Yoon et al. 2018). The late stage of the Repin culture, which showed its innovative corded decoration and bosses at the base of the neck (Figure 21), is the one associated with its expansionist trend, which must have begun probably after ca. 3500/3400 BC, and included settlers from the Middle Don migrating to the north into the Upper Don, southwest into the Dnieper region, and south, to the Lower Don and the Lower Volga (Rassamakin 1999). In the Volga–Ural region, Repin features are found at transitory camps and burial mounds in the nearby Volga and Ural areas (Figure 22) during the Middle and Late Eneolithic (Morgunova 2015). These findings point to the Repin semi-nomadic culture diffusing into the Cis-Ural region with settlers. Morphometric studies have shown a potential infiltration from the Eneolithic Don–Volga steppes into the Volga Yamna population, while supporting homogeneity of Middle Volga populations during this period (Khokhlov 2016). Other Middle Eneolithic regional groups like Khvalynsk, Atlantic, Toksk, and Turganik were possibly unified under the new expanding culture, at least in part through cultural diffusion, given the scattered Repin materials and settlements in the area before the synchronous emergence of early Yamna everywhere (Morgunova 2015). This continuity of the material culture—and probably in part of the population—in the eastern steppe could have been facilitated by the sharing of a common steppe habitat and close cultural ties since the Khvalynsk–Novodanilovka expansion, which might have smoothed the transition of local groups to the new steppe economy. Figure 22. Eneolithic settlements (1–5, 7, 10–16, 20, 22–43, 48, 50), burial grounds (6, 8–9, 17–19, 21, 47, 49) and kurgans (44–46) of the steppe Ural-Volga region: 1 Ivanovka; 2 Turganik; 3 Kuzminki; 4 Mullino; 5 Davlekanovo; 6 Sjezheye (burial ground); 7 Vilovatoe; 8 Ivanovka; 9 Krivoluchye; 10–13 LebyazhinkaI-III-IV-V; 14 Gundorovka; 15–16 Bol. Rakovka I-II; 17–18 Khvalynsk I-II; 19 Lipoviy Ovrag; 20 Alekseevka; 21 Khlopkovskiy; 22 Kuznetsovo I; 23 Ozinki II; 24 Altata; 25 Monakhov I; 26 Oroshaemoe; 27 Rezvoe; 28 Varpholomeevka; 29 Vetelki; 30 Pshenichnoe; 31 Kumuska; 32 Inyasovo; 33 Shapkino VI; 34 Russkoe Truevo I; 35 Tsaritsa I-II; 36 Kamenka I; 37 Kurpezhe-Molla; 38 Istay; 39 Isekiy; 40 Koshalak; 41 Kara-Khuduk; 42 Kair-Shak VI; 43 Kombakte; 44 Berezhnovka I-II; 45 Rovnoe; 46 Politotdelskoe; 47 burial near s. Pushkino; 48 Elshanka; 49 Novoorsk; 50 Khutor Repin; 51 Shumeika; 52 Panitskoe 6b; 53 Skatova; 54 Bykovo I-II; 55 Verkhnegromnoe; 56 settlement Kyzyl-Khak; 57 settlement Kyzyl-Khak II; 58 Boldyrevo; 59 Gerasimova; 60 Orlovka; 61 Petrovka; 62 Skvortsovka; 63 Grachevka; 64 Lopatino I. Image modified from Morgunova (2015). In the Middle Volga, regions which kept a traditional hunter-fisher economy even after the expansion of Khvalynsk–Novodanilovka witness the emergence of animal husbandry with cattle and sheep–goats and a productive economy, in combination with hunting and fishing, possibly influenced by the ‘push’ of the initial expansion of Repin. So e.g. in the Lebyazhinka site in the Sok River (a tributary of the Samara river), with Lebyazhinka III (ca. 5200-4600 BC) compared to Lebyazhinka VI (ca. 4050–3700 BC), whose radiocarbon dates and specific domesticates, broadly related to the Middle and Lower Volga and to the North Caspian region, speak rather in favour of cultural diffusion of domestication to the region before the expansion of late Repin settlers (Korolev et al. 2018). The presence of regional traits in pottery (a diversity also present in the west), and especially the maintenance of a mainly sheep-herding economy (ca. 65% sheep–goat and only 15% cattle in grave sacrifices) in the Don–Volga–Ural and in the north Caucasian–Caspian early Yamna groups (Anthony 2016), contrasting with the prevalence of cattle herding among Repin settlers and to the west of the Don River (later continued in the Catacomb culture) further supports a limited colonisation wave in the east. To the west, demographic pressure and migration seems to have been the main cause of the demise of local cultures. In the north Pontic region, this expansion is considered a true “colonisation” (Suppl. Fig. 8): their demographic impact is seen in the dramatic reduction in territorial extent of Kvityana and Deriïvka cultures, as well as in expanding Repin burial assemblages, with settlements and temporary camps appearing in the Donets basin, in the eastern Azov region, and becoming widely distributed towards the Dnieper (Rassamakin 1999; Anthony 2013, 2007). The late phase of the Konstantinovka variant had continued on the Lower Don during the late Trypillian expansion, as evidenced by the sites of Konstantinovka and Razdorskoe, but with the expansion of Repin settlers the culture ceased to exist. In the Kuban region, the local Novotitorovka culture emerged, preserving elements of the late Maikop culture. This culture features up to one in four graves with wagons or wagon parts (wooden wheel rims), possibly graves of blacksmiths, a custom common also in late north Pontic steppe cultures. Further connections of the north Pontic area with the Caucasus and of Maikop with the steppe are seen in the imports of arsenical bronzes from Caucasus mines, as well as in the characteristic burials in stone cists beneath grave mounds in the Kemi Oba culture of Crimea featuring Maikop elements (Parzinger 2013). Contrasting with the characteristic adaptation of the Repin culture to a full pastoral economy, relying heavily on the exploitation of cattle and related secondary products, as well as on horse meat (up to 70% faunal remains in certain sites), north Pontic cultures had specialised throughout the 4th millennium BC in sedentary settlements relying mainly on wild animals, aquatic products, sheep–goat herding, and limited horse-related exploitation. The shift to cattle herding is not detected in the Mikahilovka site, for example, until the emergence of the Yamna culture ca. 3100 BC, a radical adoption of a unique subsistence economy influenced neither by climate nor by environment, which supports cultural belief and economic drivers of new settlers as the main factors (Mileto 2018; Chechushkov and Epimakhov 2018). Eventually, the Pontic–Caspian steppes became unified under a common culture. The Repin expansion is rightfully considered by many researchers as the early stage of the Yamna culture, since it became culturally and chronologically associated to the synchronous appearance of the early Yamna horizon across the Pontic–Caspian steppes, from the Urals to the southern Buh, and this culture showed little connection to the cultures of the Azov–Black Sea steppes, which it eventually replaced ca. 3300–3000 BC (Figure 23). All late Repin / early Yamna groups of the north Pontic area absorbed elements from pre-existing local Late Eneolithic formations, although there is a clear remarkably standardised, uniform burial ritual and material culture (see §VI.1. Early Yamna culture), opposed to the previous variability in the north Pontic area, which displayed e.g. cromlechs, orthostats, ditches, or sanctuaries in their burials. Similarly, in the Volga–Ural groups regional continuity is also apparent in pottery. Figure 23. Expansion of the Neolithic north Pontic steppe area (dashed line) to the north during the 4th millennium BC (red arrows), and modern boundary (red line), according to Spiridonovoi and Alöshinskoi (1999). Arrows represent the most common connections and migration routes of steppe and forest-steppe populations. Modified from Kajtoch et al. (2016). Earliest radiocarbon dates for the start of the early Yamna culture are ca. 3350/3300 BC in both the north Pontic and in the Volga–Ural regions, including the early graves with pottery of the Repin type, with the majority of dates in the north Pontic area lying in the span 3050–2300 BC, although chronologies vary widely in specific regions (Rassamakin and Nikolova 2008). The earliest radiocarbon dated full-fledged Yamna-like kurgan burial appears precisely among kurgans of the Repin culture ca. 3300–3100 BC, in a region adjoining both the north Caucasian and Volga regions (Shishlina, van der Plicht, and Zazovskaya 2011). The burial ritual continues in part the previous early Khvalynsk tradition of the Volga–Ural area, but with modifications. Individuals were buried lying on organic mats in grave pits beneath kurgans. Each kurgan contained only one to three individuals, rarely including children, and most graves include adult males, so the majority of the population was excluded from kurgan ceremonies, and we don’t know what happened with their bodies after death. Nevertheless, regional differences exist, and the Kuban–northern Caucasus region, for example, shows more children and female burials (Khokhlov 2016). The survival of Repin traditions on the Lower Don and Middle Volga regions, which gave these early Yamna groups a more archaic appearance (in the so-called Gorodtsov type), further supports that migrations from this area were the origin of early Yamna settlers in the north Pontic area. The western region shows the incorporation of foreign elements, such as the characteristic burials with wagons, assemblages including small hammer-shaped pins (rooted in earlier Repin pins, see above), and anthropomorphic stelae (a tradition proper of the earlier and contemporaneous Lower Don–Southern Buh steppe territories). These features are absent from the Volga and eastern regions, as are the impressive stratified kurgans, crammed with burials, typical of the Lower Don–Southern Buh territory. A Common or Classic Indo-European community (Mallory and Adams 2007; West 2007) must have developed during the period of close interaction between late Khvalynsk/early Repin cultures, before the expansion of late Repin/early Yamna caused the divergence evidenced in the Disintegrating Indo-European stage. Based on the ancestry found in Afanasevo individuals (Wang et al. 2019), the population from the late Eneolithic Don–Volga–Ural area probably had a quite homogeneous fully Steppe-like admixture (see above §iv.2. Indo-Anatolians and below §vi.1. Disintegrating Indo-Europeans) before the colonisation of the north Pontic area. The split of R1b1a1b1-L23 (TMRCA ca. 4100 BC) into western R1b1a1b1a-L51 (TMRCA ca. 3700 BC) and eastern R1b1a1b1b-Z2103 lineages (TMRCA ca. 3600 BC, the same for R1b1a1b1b3-Z2106) probably happened early, most likely during the expansion of Khvalynsk clans in the early Eneolithic, which is supported by the disappearance of hg. R1b1a2-V1636 from the region (although it appears in one Yamna individual from the Caucasus, see below §vi.1. Disintegrating Indo-Europeans), reinforcing in turn the concept of a unification of the Don–Volga–Ural region under a single Indo-Anatolian dialect, Common Indo-European, through demic diffusion. The later successful expansion of R1b1a1b1-L23 subclades, with R1b1a1b1b-Z2103 slightly later than R1b1a1b1a-L51, as well as the prevalent R1b1a1b1b-Z2103 lineages found in eastern Yamna samples and Afanasevo, support the presence of R1b1a1b1a-L51 lineages mainly in the western Don–Volga area, possibly as the majority haplogroup of late Repin. The expansion of the late Repin culture (and later emergence of early Yamna) in the Volga–Ural region was probably then a cultural rather than demic diffusion over populations already genetically and culturally similar. One Yamna sample from Lopatino II (ca. 3000 BC), of haplogroup R1b1a1b1-L23 (Y410+, L51-), is intermediate for the of R1b1a1b1a-L51 trunk. 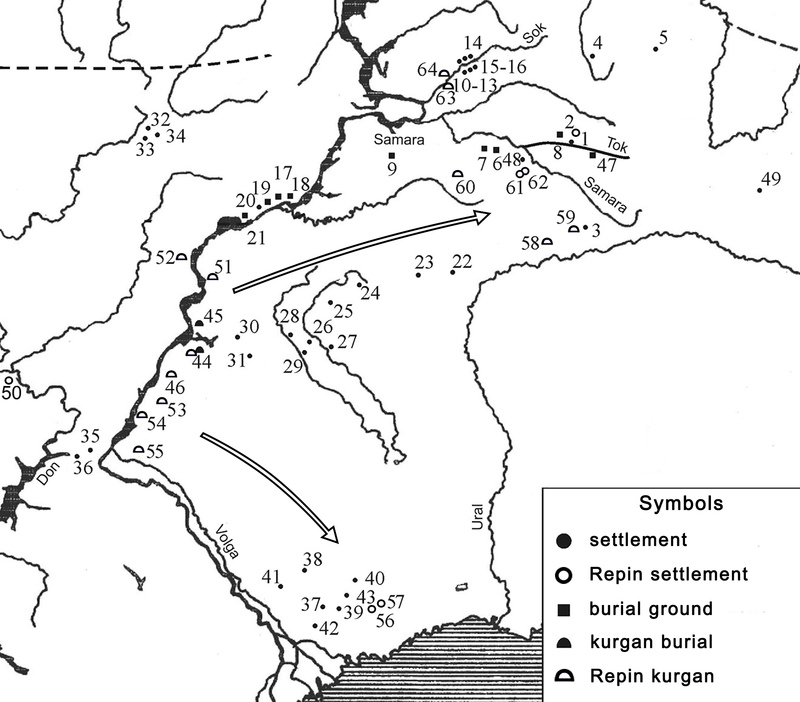 The fact that Lopatino II is part of a late Repin kurgan site in the Samara region (see above Figure 22) points to some demic diffusion of Repin clans of R1b1a1b1a-L51 lineages to the east. Further R1b1a1b1a-L51 samples have been reported from central and south Asian sites (Narasimhan et al. 2018), although their actual haplogroup remains dubious. The majority of R1b1a1b1b-Z2103 lineages found to date in the Volga–Ural area, as well as their presence in the Balkans and among western Yamna settlers, points to its original presence probably among Repin settlers of the Middle Don region, too. This extension of eastern lineages in the Don–Volga–Ural area and genetic homogeneity of the current samples do not let for the moment distinguish the ‘Northern’ Indo-European community—speaking the dialect ancestral to North-West Indo-European and Tocharian (Oettinger 1997, 2003; Adrados 1998; Mallory and Adams 2007; Mallory 2013; Beekes 2011)—from the ‘Southern’ or Graeco-Aryan one—speaking the dialect ancestral to Balkan and Indo-Iranian proto-languages (Adrados 1998; Mallory and Adams 2007; West 2007). The cultural division between a western Don–Volga early-to-late Repin culture opposed to an eastern Volga–Ural late Khvalynsk and Samaran cultures before the emergence of early Yamna may be tentatively used to identify a western community of ‘Northern’ dialect, and an eastern community of ‘Southern’ one, which is also consistent with the earlier separation of the Northern community and the continued innovations shown by the Southern group.